Loved seeing pics from the royal wedding? Wait until you see the family portrait! 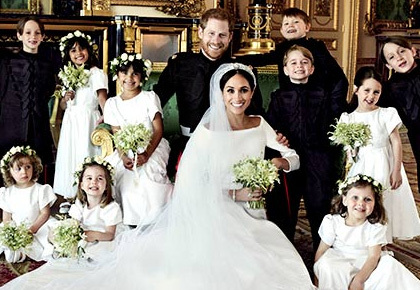 Prince Harry and Meghan Markle's -- formally known as the Duke and Duchess of Sussex -- first wedding portraits are out and just like the wedding, the royal couple bucked tradition in favour of a more casual and sentimental feel. 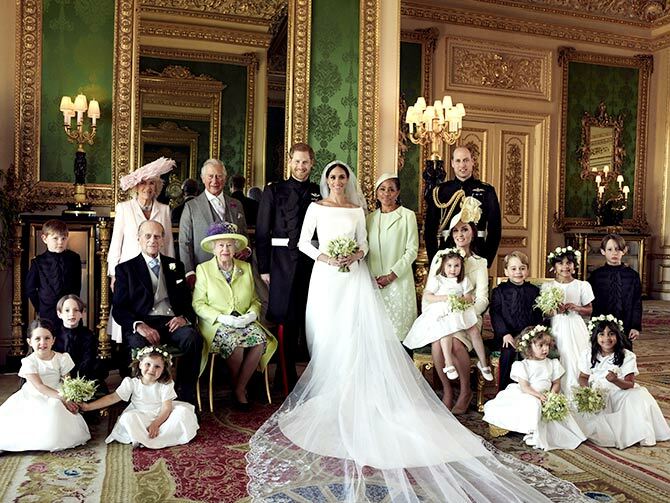 In a wedding portrait released by the royal family, the newly weds are pictured with the Queen, Duke of Edinburgh, Prince Charles and Camilla Parker Bowles, the bride's mother Doria Ragland, Kate and Prince William, and their adorable entourage of young bridesmaids and pageboys, including Prince George and Princess Charlotte. 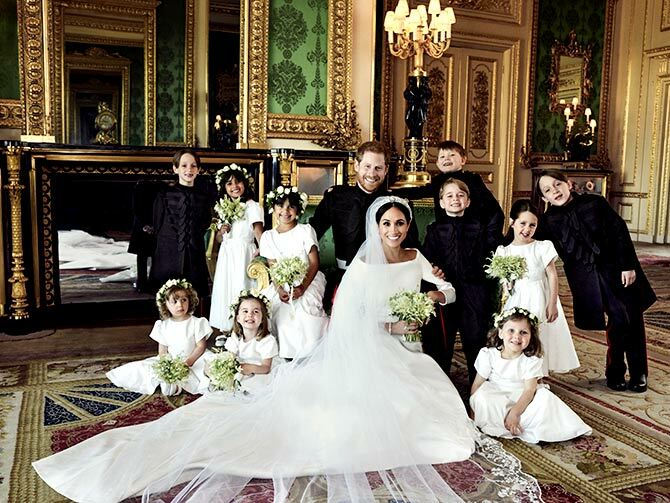 This photo of Prince Harry and Meghan with their bridesmaids and page boys was taken by photographer Alexi Lubomirski in The Green Drawing Room of Windsor Castle. Take a closer look at this pic and you will notice that the green couch on which Prince Harry is sitting is the same gilded mahogany sofa on which late Princess Diana sat cradling newborn baby Harry in her arms for official photos from his christening in 1984. 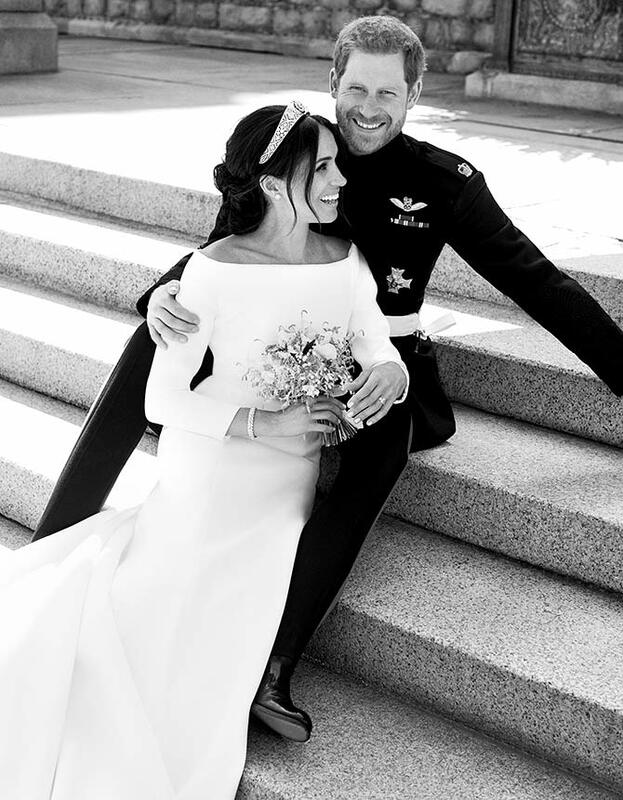 Unlike Will and Kate, Meghan and Harry added a solo couple portrait, above, in black and white. The picture, which was taken in the east terrace of the Windsor Castle, has the couple posing in a less formal look, still basking in the excitement of their wedding. 'The Duke and Duchess of Sussex would like to thank everyone who took part in the celebrations of their wedding on Saturday,' the Kensington Palace wrote on Instagram. 'This has been a beautiful chapter in my career and life, that I will happily never forget,' he wrote on Instagram. Was Meghan's bridal look inspired by Jennifer Lopez? Priyanka at the royal wedding: Which look do you like better? VOTE!